Dr. Bhavdeep Gupta and Dr. Snehal Damle present a check to one of the beneficiaries. 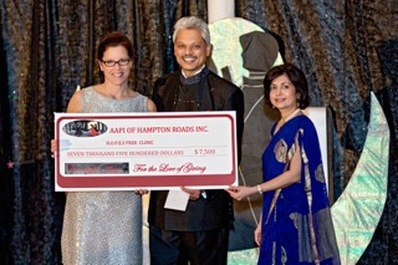 Each year since 2010 AAPI-HR has presented a fundraising gala and donates its proceeds to local free clinics as well as a scholarship fund at Eastern Virginia Medical School in Norfolk, Va.
For regular updates or information on the gala, visit us on our Facebook page or email us at aapihamptonroads@gmail.com. For more information sponsorships and tickets, click the button below.